I sit here on a (very early) Sunday morning planning what is a short work week for our team. It is hard to believe that Thanksgiving is already here! I envisioned a dental-focused post about water fluoridation, but that will have to wait until next week. Instead I find my thoughts drifting towards Thanksgiving. Thanksgiving has always been a favorite time of year for our family, as I am sure it is for yours as well. So please indulge me while I touch on two of the most important things we are thankful for this season. First and foremost, we want to thank our patients and their families for the opportunity to serve them daily. You are our motivation and the reason we strive to improve. We are continually humbled by the opportunity you have given us. Secondly, as doctors we are so thankful to work with such an amazing team. We are extremely grateful to have a team so dedicated to our patients. Thank you to everyone who donated their time and money to help make this year’s Christmas gift drive a spectacular success. 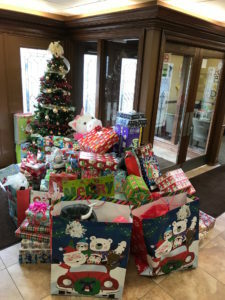 For the past few years we have partnered with The Haslinger Pediatric Palliative Care Center of Akron Children’s Hospital in order to do some small part in making the Holidays better for families who have a child with a serious illness. We are profoundly humbled by your generosity. This is a time of year that pulls us in so many directions, and yet look at all of the presents under our tree! We wish you all a very Merry Christmas and Happy Holidays! Thank you for being a part of our Orthodontic family, and we are honored to serve you. Drs. Nate, Theresa and Nick and the Mellion Team. Dr. Nate here today, and I thought I would write about something entirely outside of dentistry: community pride. Canton, Ohio has been my home my entire life. After a 10 year period away at different schools, I couldn’t wait to move back home and raise a family here. Unfortunately, with my generation, and now the Millennial generation, this is becoming more and more rare. Why am I proud to live in Canton? Quite simply, the people are fantastic! Certainly it isn’t for the weather…but is it really that bad???? No comments on that, please. Another source of local pride is Hall of Fame Week. Knowing that all of the football inductees speak with The Pro Football Hall of Fame in the background on national TV is a proud moment as a significant portion of the country focuses on Canton. There aren’t too many cities our size that receive such exposure! But I feel there is more to community pride than a TV event. To me there can’t be pride without the responsibility to be a steward to the community. And that requires ACTION! At the beginning of 2017 I was honored to be a part of Leadership Stark County’s Spotlight Program. I included the link for those that are interested. At our meetings we learned about some of the inner-workings of Stark County— how it runs, open service projects, our local history, and so much more. I gained a tremendous level of respect for those who have helped shape Stark County (and the surrounding areas). Their secret? Service to others. My hope (and challenge) is that you use this summer of 2017 for more than vacations, pool time, sports, or even barbecues. Become engaged in our community, maybe even do something service oriented. Be a steward for this amazing place we all call home. Dr. Nate here on a continuation from last week’s blog post on adult Orthodontics. As Orthodontists, we are experts on crafting wonderfully balanced smile esthetics. While the reasons for wanting an improved smile are as unique as every patient we see, there is a common underlying theme. What can increased self-confidence do for adults? Lets start with the professional world. We have so many adult patients that want to improve their smiles for their careers. The reason…there is a ton of research that talks about how important a confident smile is to the interview process, and to potential customers. The smile is consistently the number 2 focal point of a person’s eyes when they are introduced. And there are many, many more scenarios where that new smile is desirable. What if you are getting married soon, and want that perfect smile for your pictures? Or, what if you are a mother who hasn’t treated yourself in lord-knows-how-long? Wait, isn’t Mother’s Day coming up????? These are just a small sample of reasons our adult patients have sought out our practice. We offer so many treatment options, including truly esthetic methods such as Invisalign. Our incredible team is able to accommodate any schedule and any timeline. So, give us a call and come meet your new smile! Thank you for taking the time to visit our blog. Please check back often for weekly updates on fun and exciting events happening at our office, important and interesting information about orthodontics and the latest news about our practice. Feel free to leave a comment or question for our doctor and staff – we hope this will be a valuable resource for our patients, their families, and friends!